Photo courtesy of Skapeche Mode. Ska and new wave mixed together. What could be more weird? Seven guys from various ska bands “Just Can’t Get Enough” of this strange concoction. And on August 22, Alex’s Bar won’t be able to “Enjoy the Silence,” because Skapeche Mode is rolling into town. Yes, a band called Skapeche Mode exists and they’re bringing their sound to Long Beach. You better grab your “Personal Jesus” to save you because their music can’t be taken too seriously. In fact, singer Kebin Smith, aka Skrince, said the band started as a joke. To its credit, Skapeche Mode boasts some well-known musicians from the ska scene. 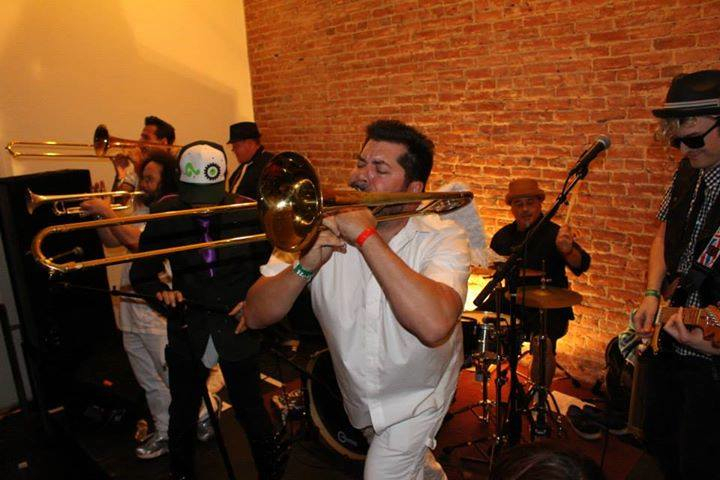 Guitarist Brian Mashburn and trombonist Tbone Willy were original members of Save Ferris (that other ’90s female-fronted ska band that didn’t feature Gwen Stefani), while the other five members currently play in other ska bands popular in the local scene. During their live sets, Skapeche Mode plays ska versions of Depeche Mode songs, which Smith admits is an odd mix. However, he said it was also just what he needed to exit a depressing time in his life. Trombonist John Pantle said the response from the ska and new wave communities has been positive so far, especially when combined, because that scene is so small. In fact, they seem to share it with only one other band, Skadonna. Yeah, just let that one sit for a bit. This newfound genre might not be going anywhere for a while. Pantle said turning Depeche Mode into ska songs was an easy transition, because he believes Smith wrote all the songs himself (though we question the sincerity of his belief). Sorry to break it to you, John, but four guys from England and their more than seven million fans on Facebook (and then some, to put it lightly) beg to differ. After begrudgingly admitting that he didn’t actually write the songs (told ya so, John), Smith said the band has fun translating between two very different styles of music. Pantle said the band has played at Alex’s Bar before and looks forward to playing it again, along with the Zombie Walk in October. “We look forward to disappointing an entirely new group of drunkards,” he said. Smith added that the band has a close relationship with Alex Hernandez personally. Skapeche Mode will play Alex’s Bar, located at 2913 East Anaheim Street, on August 22. Tickets are $15 and available on the Alex’s Bar website.